Continued from PT-91 Preview . . .
Assembly- mid way. This shows the placement of some of the metal parts (tow hooks, spare fuel tank brackets, main gun, MG). 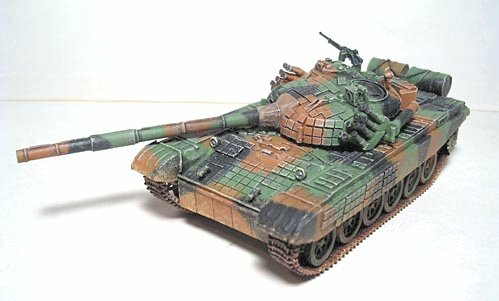 I found several useful websites on the web showing the assembly of 1/35 scale PT-91 models. Also, my Galaxy kit has come in handy in determining the exact positioning of parts when the instructions are unclear. The kit does not have return rollers; if you look up under the side skirts, you'll notice they are missing, so I'm adding some small wheels of the appropriate size from my spares box. If you don't plan on looking up under the skirt (:-o), then you can live without the rollers. I also added a wooden beam made from a section of brown sprue, roughened up with a file. The instructions show this beam, but it was not included in my package. The more I look at the kit's tracks, the less I like them. The pattern looks incorrect, so I will use a set of spare T72 rubber tracks from Galaxy. The colors I'm selecting are: Floquil RML greenblack, Testors flat green, and Humbrol leather. Several photos show the PT91 with a rather bright green color, as opposed to a dull olive green. An alternative scheme uses the same colors plus light sand patches. Assembly - suspension: For tracks, I took the Galaxy T72's and soaked them in laquer thinner. This leaches out the softeners, but the first effect is that the rubber tracks soak up thinner and actually EXPAND! Once you air dry them however, they SHRINK and are less flexible. The result: the tracks are a better size for this kit (the Galaxy kit is larger than 1/72) and they will accept paint better. Assembling the suspension was a long procedure, however, as the wheels are not attached with strong axels, but have rather small attachment points, so the wheels will pop off rather readily while trying to get the stiff tracks on. But they look much better than the kit tracks. Here's the finished kit. I only added some strings as hoses from the fuel drums. I really like the details on this (except for the aforementioned tracks) and they come out nicely after a wash and drybrush. One could add more details such as turret-mounted searchlights. 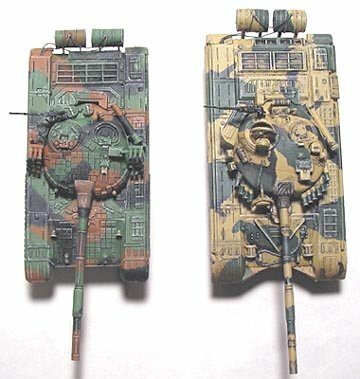 Here is a side-by-side comparison of the Modelkrak PT-91 and the Galaxy T72. Both claim to be 1/72; I suspect the Galaxy kit is too big!